Eston is on the northern boundary of the North Riding near the mouth of the Tees. The town is 240 miles north-west of London and 5 miles south-east of Middlesborough. The cemetery is situated a quarter of a mile north of Normanby on the road to South Bank. Eston Cemetery, was formed in 1863, and includes the old Church and Churchyard of St. Helen. Until 1935 it belonged to the Eston and Normanby Burial Board and was then taken over by Eston and Normanby Urban District Council. 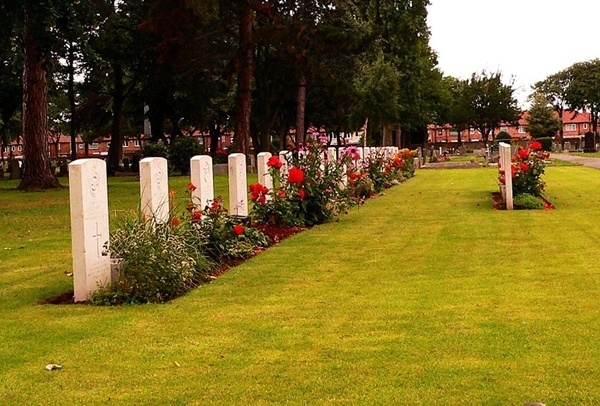 There is a group of 22 Second World War graves in Section P in the centre of the cemetery, one of which is the non-war grave of a Merchant Navy seaman whose death was not due to war service. There are 55 Commonwealth burials of the 1914-18 war and 43, including 1 unidentified R.N. sailor, of the 1939-45 war here. The Cross is erected in front of the West Lodge. 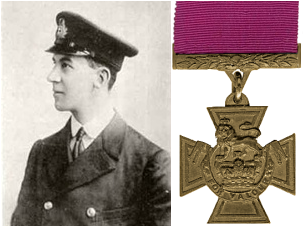 Lieutenant Richard Douglas Sandford, V. C.
H. M. Submarine G. 11., Royal Navy, died 23rd November 1918, aged 27. Plot J. U. 709. Son of Ethel R. Sandford, of 15, The Beacon, Exmouth, Devon, and the late Ven. E. G. Sandford, Archdeacon of Exeter. Citation: An extract from the Fourth Supplement to "The London Gazette," of 19th July, 1918, referring to the raid on Zeebrugge, 23rd April, records the following:- "For most conspicuous gallantry. This officer was in command of Submarine C.3. and most skilfully placed that vessel in between the piles of the viaduct before lighting his fuse and abandoning her. He eagerly undertook this hazardous enterprise, although well aware (as were all his crew) that if the means of rescue failed and he or any of his crew were in the water at the moment of the explosion, they would be killed outright by the force of such explosion. Yet Lieutenant Sandford disdained to use the gyro steering, which would have enabled him and his crew to abandon the submarine at a safe distance, and preferred to make sure, as far as was humanly possible, of the accomplishment of his duty."